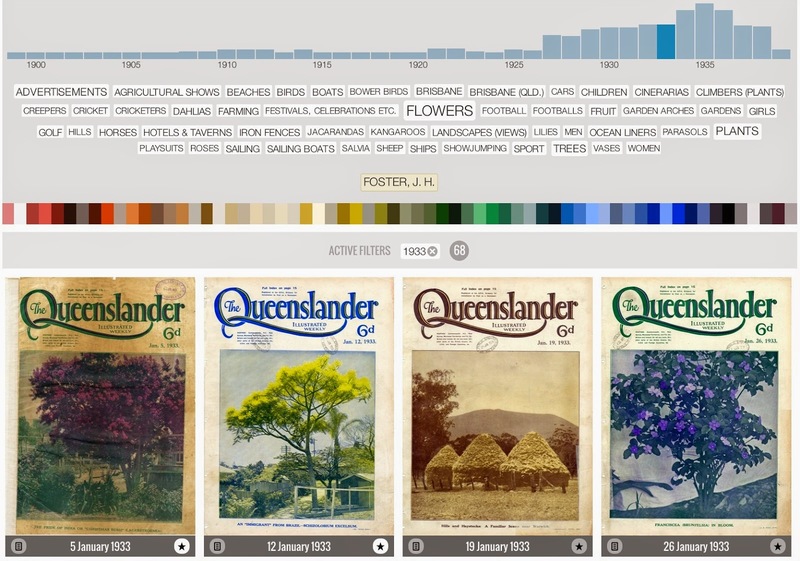 Discover the Queenslander is our latest generous interface project, commissioned by the State Library of Queensland to showcase their collection of covers and pages from The Queenslander newspaper. Published 1866-1939, The Queenslander was the illustrated weekend supplement to the Brisbane Courier Mail. This collection includes around 1000 covers, advertisements and illustrations - a beautiful slice of Australian pre-WWII visual culture. Geoff Hinchcliffe and I developed a web-based interface that builds on our previous approaches - rich overview, browsing and visual exploration - and adds some new techniques. Here I'll provide a quick outline; in the following post I will focus on the web framework we used - AngularJS - which I think has some interesting applications for digital collections. The Mosaic view provides a chronological overview of the collection - each tile represents items from a single year. Like the Manly Images mosaic, the tiles gradually reveal their contents - in this case they are also directly navigable. The Grid view is a more general-purpose explorer for browsing subjects, creators and years as well as colours. Both Grid and Mosaic interfaces link to a detailed item view. There's nothing radically new here - though there are a few new elements that extend on our generous interfaces repertoire. Inspired by the qualities of the collection images and the related work happening at Cooper Hewitt, Geoff and I were keen to experiment with using colour to explore the collection. The process was (surprise!) more complex than we expected, but ultimately rewarding. Using some palette extraction code that Geoff developed, we first pre-built a palette for each item. These colours are stored in the collection metadata, and act much like any other metadata field. The interface then dynamically builds an "overview" palette revealing the colours in the current set of items, and both the item palette and the overview palette act in turn as filters; rinse and repeat for open-ended colour-browsing. Note also how the filters and facets in the grid view interact; selecting a colour will also reveal corresponding dates, creators and subjects (and vice versa). This project also introduces some simple personalisation, with the ability to curate and share a collection of favourite items. We opted for a lightweight, no-login approach using HTML5 web storage (essentially fancy cookies) to simply track item IDs. Sharing a collection is a simple as sharing a URL with a list of IDs baked in; and because collections operate within the standard grid view they get filters and facets too. Finally a little feature that I am particularly fond of is the Trove link on the item page; a simple demonstration of how we might start to link up collections across institutional boundaries. 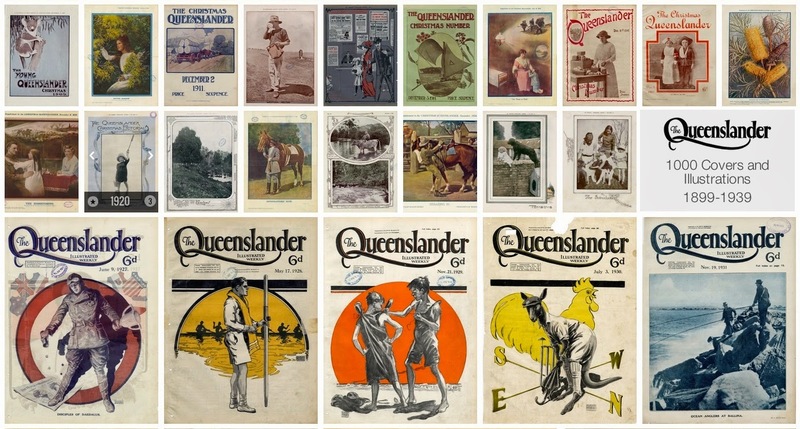 In this case, the State Library of Queensland has high-res images of covers and illustrations, while the NLA's Trove publishes the full contents of The Queenslander (albeit with low-res scans). Using the Trove API we simply harvested the full list of issue dates and corresponding Trove IDs, then matched them against the SLQ items. So each Queenslander item also provides a link to its source issue, providing additional context as well as opening onto further exploration.